Capsule Summary: The 4077th becomes obsessed with a mystery novel as a distraction during a supply shortage. Who else wants to read The Rooster Crowed at Midnight–“another brain-teasing, spine-chilling whodunit from the prize-winning pen of Abigail Porterfield”–whenever they watch this episode? The Monster M*A*S*H Wiki has a lengthy article about the novel that includes plot details and a cast list. Watching “The Light That Failed” requires suspending some disbelief. Has literally every single person at the 4077th read every single book in camp? Who is keeping track of where each chapter is and who gets to read which chapter next? More importantly, when B.J. discovers the missing last page, everyone else is still reading earlier chapters. So why does he reveal the identity of the killer, spoiling the ending for everyone? He’s wrong, but they don’t know that. The Charles B story is uneven. As is the case with many Season 6 episodes, the writers are still working out his character. They know he’s pompous but unlike Frank, a truly talented surgeon. Here they’ve given him Frank’s cowardly streak and it’s not a good look for Charles. He follows Hawkeye out of Post Op, appealing for reassurance that he’s not at fault, acknowledgement that he can admit he made a mistake. Hawkeye blows up, furious at how self-absorbed Charles is. He may technically be a brilliant surgeon, but he’s selfish and only cares about himself. Charles accuses Hawkeye of being jealous of his talent. Later, during the tag scene, he grudgingly admits Hawkeye had a point and promises to care more about his patients. 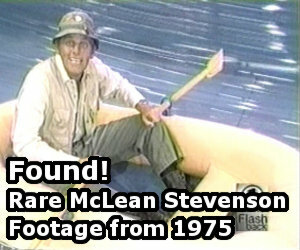 Sadly, the scene is played for laughs, with Charles trailing surgical gauze after him like toilet paper stuck to a shoe. Charles reading to Margaret hints at the possibility of a romance between the two, something that pops up in several Season 6 episodes. Thankfully, the writers wisely decided not to pursue it. B.J. realizes the last page of The Rooster Crowed at Midnight is missing. The 20th Century Fox prop department had to use a real book to make the prop The Rooster Crows at Midnight hardcover. I wonder what book they used. I also wonder if someone walked off with the remnants of the prop as a memento. When Klinger rushes into the OR with a light bulb, he knocks into a tray of medical equipment. At first, I thought this was a mistake left in by the director. But Klinger also knocks into the tray when he leaves the OR looking for a light bulb. Either Jamie Farr had an off day during filming, or this was planned in advance. I haven’t seen this episode in a very long time, so this may be upsetting to those who love this episode. I find fault with a number of plot points. First off, when Charles is reading to Margaret, she gets worked up over the content Charles reads and abruptly tells him to leave her tent. Then, after they call Abigail Porterfield about who the murderer is in the book, the supply truck arrives and Col. Potter announces on the PA system that Avery Updike wasn’t the murderer, he never says who the real murderer was, and Hawkeye ruins it by confessing in an upper crust accent that he’s the killer. This was an OK episode, aside from the twists and turns in “The Rooster Crowed at Midnight”. This is a weak episode; not usually one that I would go out of my way to watch again. I’ve been waiting for this one. I’ve always liked it. Something about the way they all get into the book, it’s cool. If there’s one bad thing I can say about this episode, it’s that other episodes did it better. And that goes for the main story, as everybody goes crazy over the book, and the main story where Charles has a humbling experience as he realizes he’s not as perfect as he’d like to think he is. But even so, I still really enjoyed this one overall. There’s some very enjoyable moments as we see people get worked up over someone reading slowly, and seeing the camp trying to figure out who the murderer, and stuff like that. And likewise, I though there were some good comedic moments in Charles’ story, as he tries to win Hawkeye’s approval, whether or not he was in character (I think there are a lot worse offenders in this regard in season 6, but I suppose the case can be made, especially when comparing it with a similar episode, like “Major Ego,” where he made a similar mistake and ripped up the article he cared so much about). Though, I should mention this: I couldn’t agree more, in regards to the sexual tension between Charles and Margaret. That was one of the worst aspects of Charles’ first season, as they struggled to develop his character. It was always so cringey, and beneath both characters. I’m so glad they abandoned the idea after this season. This is such a coincidence. I was just thinking about this episode this morning, particularly the ‘superior surgeon’ ‘superior sturgeon’ argument Charles and Hawkeye have in front of the Swamp. Now, I have to sit down and watch this episode. Surprised no one mentioned the fact that in the pilot we see a library that is completely full of books. Granted it’s the only time we see that, but shouldn’t those books all still be there somewhere? 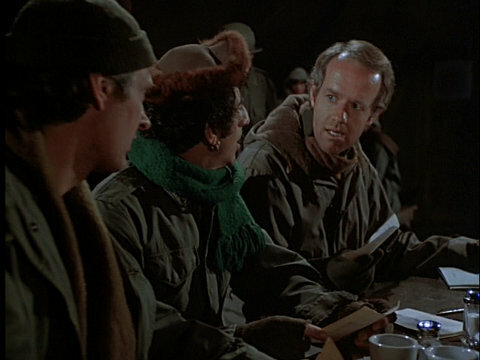 I know it must be boring as hell being there in the M*A*S*H unit at times, but it always seemed so far fetched to me that people would be so starved for a book so as to go crazy like that. Nobody could have a box of books shipped from the states? All in all a decent episode. I too am glad they did not pursue the Margaret and Charles relationship thing. The two of them don’t fit together AT ALL besides the fact that they’re the only two Major’s and senior ranking personnel under the Colonel. In regards to the sexual tension between Margaret and Charles, it was clear that the writers actually tried to look for ways to bring them together, because they wanted him to be a new love interest for her now that Frank was out of the picture, but Gene Reynolds (despite having left the series at this point) did not approve of it, mainly because he was the one who was so adament about Margaret getting married and moving beyond Frank – and in fact, he wasn’t too pleased that she and Penobscot ended up getting divorced; marriage was important for the growth and development of Margaret’s character, and for her to get divorced just a couple of seasons pretty much tossed that all out the window. Yea one of the reasons I really don’t like Margaret as a character. I liked her early on in the Trapper/Blake era with Frank just because it was just Trapper & Hawkeye vs Margaret and Frank, but after a few seasons of that, it was really time for her to grow. She started to do that with Donald, but even that just seemed wrong because he was always such a turd. Then after the divorce she was just got worse as a character, and never really improved. She had her moments, but they were few and far between. Margaret has always been a rather polarizing character: either you like her, or you don’t. Agree with everything you just said there @BDOR! I almost said that exact thing about Margaret when she was being “courted” by Donald during season 5 in my post above. She acted just like a little school girl about it, especially when around Frank, which always was baffling to me given their past relationship. It was almost like she was doing it out of spite, I guess to get back at him for having an affair for so long (even though it was with her), or maybe to get back at him for not leaving his wife for her??? Was never really sure but she was basically just a big B about the whole thing. 100% agree on her being a huge hypocrite too, but honestly it’s probably pretty realistic for some people. I just recently overheard a conversation at work where a female co-worker of mine was furious after finding out the guy she was “seeing” lived with his girlfriend, despite the fact that she too lives her boyfriend. Maybe the writers behind Margaret were writing from experience, not really sure, but it still puts me firmly in the “don’t like Margaret” camp. Margaret, BJ, and Hawkeye (yes Hawkeye!) were always the 3 characters I liked the least out of the 11 main cast, but Margaret is probably the worst of the 3.